Considering how much the last Bronze Statue of Boba Fett was, start taking out a loan now. Very, very cool looking. I'll post some updates on here as they become available. Real quick, though, here's how much their Vader Bronze statue went for, so I'm guessing it's going to be something along the same line. 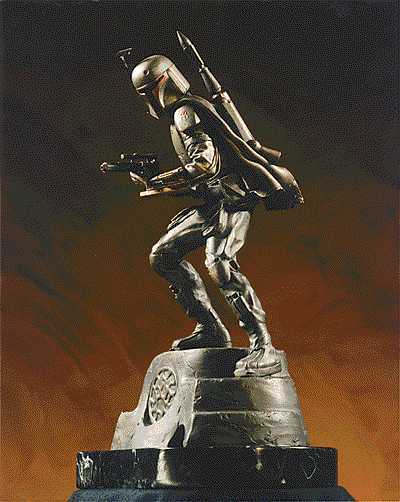 Here's the last bronze statue that was done of Boba Fett. It was done by Randy Bowen and went for around $3,000.00 through Dark Horse Comics. I'm sure it's selling for more now. Only 50 of these babies were made, at the time. Oh damn it looks good...but youre right Sadriel. Its 'spensive...Why did us Fett fans have to pick the most expensive character to collect? Yup, they hit us where it hurts. Well, they finally have some full size pics of the statue. Not too shabby. Apparently they're only making 75 of these babies. And they're actually taking pre-orders, too, but the price tag is pretty much what we figured it'd be. About the same as the Darth Vader bronze statue, around $4750.00. OUCH!!!! I'd never heard of the higher the number the more expensive it was. I was always under the impression that the lower the number in the series, the more valuable it was. You've got to be kidding me.... that is just no fair. Damn, that is nice... but I couldn't justify that purchase. I thought the price was reasonable at first, because I only glanced at it, and thought it was life size. But now I know that it's just 20 something inches, it is way overpriced. I still can't believe how much this thing is. My jaw dropped when I saw the price and I had to do a double take. Even the lifesize statue isn't this expensive.